Pale mud bricks, teak wood and a textured black coating are all used to front this house in Mexico City, which architecture studio DCPP has designed around a pair of patios. 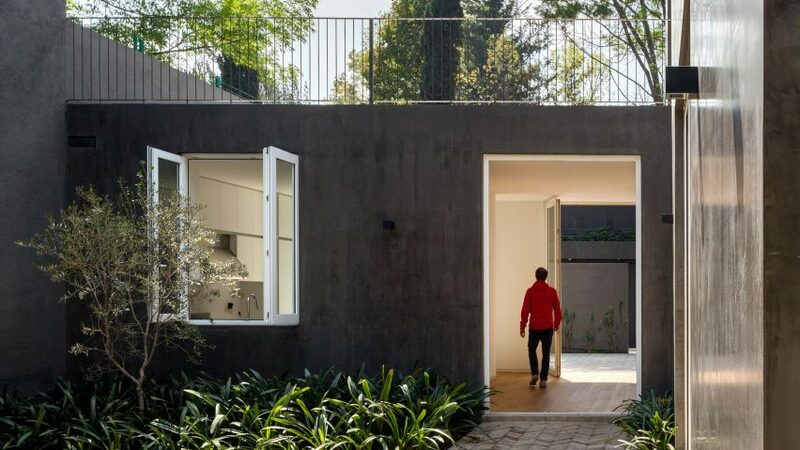 Casa Campestre 107 is located in the city's San Angel Inn neighbourhood, where the local studio has completed another residence around a network of courtyard gardens. This time, the architects designed the house with concrete block walls coated in black Corev – a paste-like finish intended to mimic the artisanal stucco traditionally used in the area. "The construction was not extraordinary, we built it using conventional concrete blocks," architect Jorge Quiroga told Dezeen. "The only special attention was put on the exterior finish, this black-coloured modern version of an artisanal stucco used in Mexico, making reference to the traditional district of San Angel in Mexico City." The front facade also features mud-brick walls, with perforations to allow for natural ventilation, while the teak wood forms garage doors. The residence, which was completed in 2013, occupies a large rectangular plot measuring 33 metres long and 11 metres wide. It has a T-shaped plan, organised around a courtyard at the front and another outdoor space at the rear. The main two-storey volume extends down one side of the site to form the long and narrow crossbar, while a single-storey portion sits perpendicular. On the ground floor, the architects divided the interior of the T-shape into two parts. The arrangement separates the living room, a dining room and a kitchen at the front from more private space like a master bedroom and a family room at the rear. Each of the ground-floor rooms open onto the paved stone courtyards. A pair of doors also lines up to lead straight through the central block to provide access to the outdoor spaces on either side. While aiming to create a close relationship between inside and outside, DCPP selected contrasting materials for the interior. White-painted walls provide a stark distinction to the exterior, and teak floors offset the stone paving of the patios. "We were aiming to have a noticeable contrast between the indoor and outdoor perception," said Quiroga. "Although you have long views of the patios and terraces, the material selection was oriented to mark a clear contrast in this transition." The main staircase features wooden treads and leads up to the first floor of the main volume, which is occupied by a study and another two bedrooms. On this level, one of the bedroom features glass doors that open onto the roof of the adjoining lower section. DCPP Arquitectos is led by architects Pablo Pérez Palacios and Alfonso de la Concha Rojas. The studio recently completed a low-lying weekend retreat in Mexico, while its other projects include a textile warehouse with white stone walls and a black house with a high-walled courtyard.